Owners of condos or stratas are familiar with the notion of paying monthly home maintenance fees. These fees go towards the upkeep of the common areas of the building, as well as the regular maintenance of the exterior of the building, such as window washing, lawn and snow care. All of these fees add up over time, but it’s a necessary cost of maintaining the condo’s appearance and to prevent deterioration from the natural elements. Many home owners scowl at these fees and often proclaim that living in a condo or strata is a waste of money because owners are “throwing” their money away in expensive maintenance fees when that money could be put into paying off their mortgage instead. These claims are completely false because home owners have just the same expenses as condo owners if not more. Some home owners turn a blind eye to the maintenance of their homes because they prefer to wait till it is broken before paying to fix it. If you are a home owner, have you ever thought of these as regular home maintenance expenses? Window Replacement – A new home may have an air tight seal, but the constant pounding from sunlight and rain eventually erodes the frame of windows. Waiting for a window to start leaking is worse. Water damage or even excess heating and cooling bills can become a problem. Replacing windows is expensive and might cost of a home owner tens of thousands of dollars. Start planning and saving now unless you want to have a sticker shock happens years down the road from now. Roof Repairs – The term “having a roof over your head” doesn’t last forever. Roof replacement starts becoming necessary when you’re living in a very old home. Wait too long to replace the shingles and you might end up having a stream of water coming down over your head in a bad rainstorm. Appliance Replacement – When you rent the landlord owns the appliances. When you own they are yours. Replacing any appliance is a very expensive cost and could cost you over $5000 just to replace everything in your home. New technology in appliances have driven up repair costs as well. Replacing a burnt out circuit board in your appliance could be a very expensive cost. Don’t expect all your appliances to last over 10 years, that’s wishful thinking in today’s terms. Yard Care – Condo owners don’t cut grass or shovel the snow. Their maintenance fees handle all of those costs. Maintaining your exterior property can be very expensive. Fertilizer for the lawn, watering bills, buying soil, buying sand or gravel. All these little costs add up over time. Most people don’t think about these as home maintenance costs but they are. Some people enjoy outside labour in the sun and cold but other’s don’t. Just remember that all those power tools like lawnmowers and snow blowers all cost money to maintain and buy. Heating/Cooling – Furnaces and air conditioner units are expensive units for a home. Depending on the size of your house the replacement costs can be very high. Additionally, HVAC systems need to be maintained on a regular basis. You wouldn’t drive your car for years without an oil change would you? Why would you let your furnace and air conditioner operate without regular maintenance? Cleaning your air ducts should be done to maintain airflow throughout your home. It’s also important to check for leaks in your ducts after many years because the constant heating and cooling could deteriorate the conduits. Window Cleaning – Ever wonder why condo buildings with glass glisten in the sun? That’s because tens of thousands of dollars are spent yearly just cleaning windows on the exterior. Perhaps owning a home puts you in a lower standard of living and you don’t care about the cleanliness of the exterior of your home, but if you want the luxuries of what condo owners get, then you’ll have to pony up the cash. Extras – There are many other things in your home that can require regular maintenance. A pool, hot tub, deck, garden, fountains, fences, etc… All of these things require money to maintain to keep them working and functioning. These costs should not ignored because these are the surprise costs that might turn what might be a fun trip to the Bahamas into cleaning up animal excrement in your pool. Just because your house is standing, the roof isn’t leaking and the garage opener is humming along doesn’t mean that eventually these things don’t need to be repaired or replaced. A home owner has the duty to anticipate and prepare financially for these events. A home maintenance fund is not your emergency fund. That difference should be known. An emergency fund is not meant for regular home repairs, but rather for an extraneous or unfortunate circumstance for which money is needed. Home maintenance is a known cost and therefore should be budgeted into your finances. As a rule of thumb, home maintenance costs average 2-3% annually based on the cost of the home. In some home markets where housing is in the stratosphere, such as Vancouver, Toronto and Calgary, the cost may not be the 2-3% of the home, but home owners should still be budgeting somewhere between $4000-6000 annually to maintain their home. You might think that after ten years that you’ll never spend $50 000 maintaining your home, but you’ll be surprised. As homes age, the cost of fixing things can grow exponentially. You may look at some of these costs and think that you’re a great handy man and you can fix everything much cheaper. That might be true, but tools, materials and labour all have a cost. 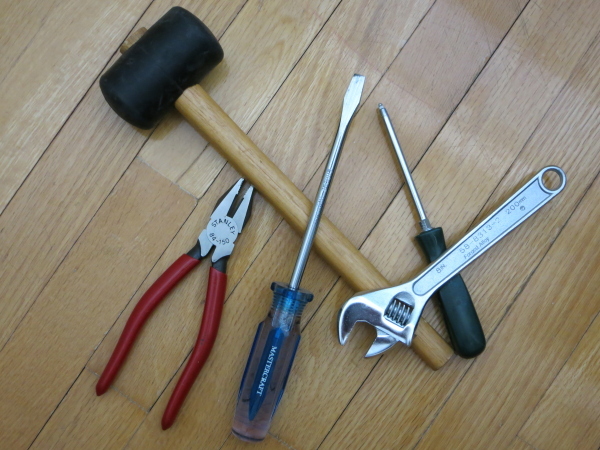 Tools you buy are part of your home maintenance costs. The materials you buy are the same. How much is your time worth? Do you enjoy your summer weekends with friends or do you prefer to do household chores instead? At the end of the day these are decisions you’ll have to make if you cannot afford to maintain your home any other way. Regular household maintenance costs need to be budgeted into people’s personal finances. A simple way to start a household fund is to open up a different bank account and make regular deposits into on a monthly basis. Incorporate it into your regular investments, but just be aware that that portion of the money is earmarked for a specific purpose. It’s important to keep your home well maintained. Waiting for a catastrophe to happen such as burst pipes and leaky roofs can lead to more unexpected costs that could ruin your finances. If these are the difficult choices that you are not prepared to make, perhaps home ownership isn’t for you.